What do Education and Work Records contain? The Education and Work section of findmypast contains records relating to apprentices, the merchant navy, occupations, and schools. These records depict the daily lives of a wide range of ancestors with varied nationalities, backgrounds, and skill sets. These family history Education and Work Records often contain rare photographs or detailed descriptions of the person, which is a rare glimpse for family historians to see what an ancestor looked like, and any physical traits you may share. 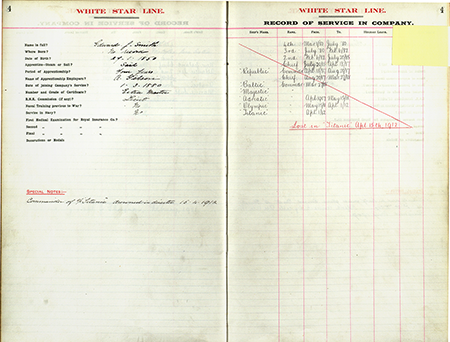 See White Star Line records to read in depth records written by officers that worked on the Titanic or sailed to Australia and New Zealand. The Education and Work records give a peak into how life was at the turn of the century when companies strove to create luxury ships that carried passengers across rocky seas to a foreign land. These Merchant Navy, also known as Merchant Marines records, are particularly valuable due to the wide range of people they include. It is possible to find records for British nationals, foreign British-registered men and women, experienced crewmen and young cabin crew. Whatever your ancestor's role on the merchant ships, it is well worth searching for them in these records. These family history records also include many nationalities that are still rare in findmypast's collections, including Chinese, Indonesian, Russian and Caribbean. A key benefit of these records is that you may find a photograph of your ancestor. For the first time, you could discover what your seafaring predecessor looked like. The photographs of the mariners are enormously evocative of the inter-war working class men who made the British merchant navy what it was. 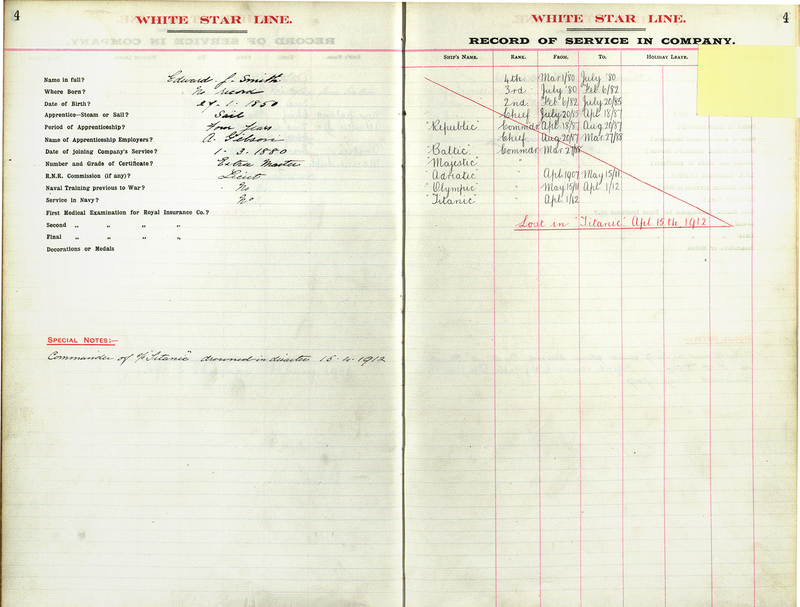 Search more than 2.6 million Merchant Navy Seamen records. The White Star Line was founded in England in 1845 with a fleet of sailing ships trading mainly to Australasia. Competition was fierce on the North Atlantic, so White Star set out to build luxurious, comfortable ships to cross the ocean at record-breaking speeds. The Germanic and Olympic were highly regarded in their day, as was the much-anticipated Titanic until her loss in 1912. Details of the officers who served on this ill-fated ship are included in these records. Search records of more than 1,000 commanders and officers who served as navigators on the ships of the White Star Line, covering the period between 1868 and 1934. These records are abstracts from tax records kept by the Inland Revenue. They are of exceptional value to the family history researcher, containing the name of the apprentice, in most cases the name of the apprentice's parent or guardian (usually the father, though sometimes the mother, if the father was dead), the place the apprentice came from, his father's trade, the name of the master to whom he was indentured, the master's trade, the place where the master lived, and the value of the premium paid to the master for taking on the apprentice. About 350,000 indentures are included from all over Great Britain (about 20 percent are Scottish). These records list the entrance of 29,251 pupils into around 10 schools (18 registers). The records include evacuees sent to Glamorgan during the Second World War, who are identifiable by the name of their previous school and the name of their guardian. Industrial schools were set up in the middle of the 19th century to provide lodging for destitute children. They were intended to provide occupations to prevent vulnerable children from falling into criminality. Children would be educated and taught a trade and could be there for a set period or throughout their education. The ancient Corporation of Trinity House was responsible for the supervision of lighthouses and buoys around England.The great majority of the Trinity House papers are Petitions, with related documents, but there are two other separate collections of papers: Apprentice Indentures and Miscellaneous Papers. A registration system for dentists was established in 1878 with the first Dentists Act and subsequently a register recording the names, addresses and qualifications of those registered was published. This was an important step in the regulating of dentists – a discipline that had its roots in the Barber-Surgeons of the Middle Ages. This set of records covers a geographical area served by findmypast.co.uk's sister site findmypast Ireland. As we are now organising records by country, these records will be removed from the UK site in May 2012. If you'd like to access them on the UK site, please do so now. The Medical Directory for Ireland was first published in 1852 and detailed the locations and publications of medical practitioners who held qualifications as either apothecaries (pharmacists) or doctors in Ireland. The Medical Act of 1858 set to regulate the medical profession and abolish unlicensed practitioners. The 1858 directory captures the Irish medical world at the point of this movement towards stricter regulation through the General Medical Council. As well as listing practicing professionals, the directory also contains obituaries. The Medical Register was first published in 1859 as a direct result of the Medical Act of 1858. The act sought to abolish 'quacks' and charlatans: unlicensed practitioners of medicine who had not gained the requisite qualifications befitting their position. In tandem with the publishing of the register, The General Medical Council was established. The GMC is the regulatory body of the medical profession and The Medical Register is its official annual list of licensed doctors. The GMC has the ability to revoke licenses at any time if it believes that one of its professionals is unfit to perform their duties, or have been doing so in an inappropriate fashion. Being struck from the Medical Register prevents a doctor from practicing. The Education & Work section also contains occupational records for the Dorset Hemp & Flax Growers 1782 - 1793, Manchester Police Index 1858 - 1941, Match Workers Strike 1888, Teachers' Registration Council Registers 1914 - 1948, Thames Watermen and Lightermen 1688 - 2010, and Trinity House Calenders 1787 - 1854.